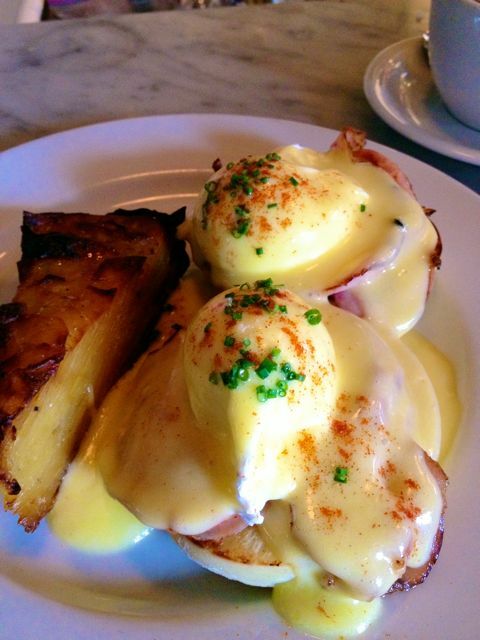 Because I am such a food nerd, I had already checked the menu over a few times and knew I wanted to try the Classic Eggs Benedict. Now I never order the classic version because do NOT like deli ham. But I knew this place would have good meats, since that is what they do. I was not disappointed at all. It was perfect. The hollandaise sauce was perfect, even though it didn’t have the touch of lemon that I do love. The potatoes on the side were a great compliment. 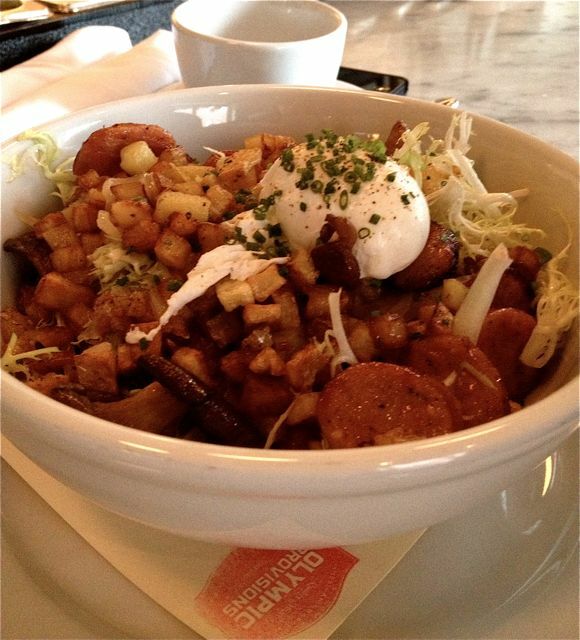 My husband wanted the kielbasa hash and after we asked to make sure it was a good choice, and assured it was the best choice, we ordered it. This was so very good. I can’t tell you how good this was. It came on a bed a frisee. At first it seemed weird, but it was actually a great combination. I have never seen that with a hash before and I liked it. We enjoyed the kielbasa so much we purchased some to take home. Since we went without our kids, we decided to make something special for them. I sauteed some potatoes, veggies and the kielbasa. It was a huge hit. As a matter of fact I didn’t make enough. We also bought some of the Sweatheart ham kielbasa and for breakfast I made a veggie and kielbasa scramble. Another huge hit. The atmosphere is somewhat sterile, but it works. It’s not a huge space, but they have made it to accommodate quite a few people. The coffee is Stumptown and they brew it a special way. He explained it, but I didn’t understand. Just go try it. The tea was a loose leaf tea from Steven Smith, which makes sense, since it’s right next door. Pricing was a bit on the high side, but we really enjoyed our food, so we were happy. Olympic Provisions NW is located in the NW Industrial area. There is also a SE Location. Olympic Provisions is a favorite. Check out more of my favorites.